Messier 63 (M63), also known as the Sunflower Galaxy, is a spiral galaxy located in the northern constellation Canes Venatici. The Sunflower Galaxy lies roughly 37 million light years from Earth and has an apparent magnitude of 9.3. Its designation in the New General Catalogue is NGC 5055. Messier 63 is quite easy to find even though it lies in a relatively faint constellation. 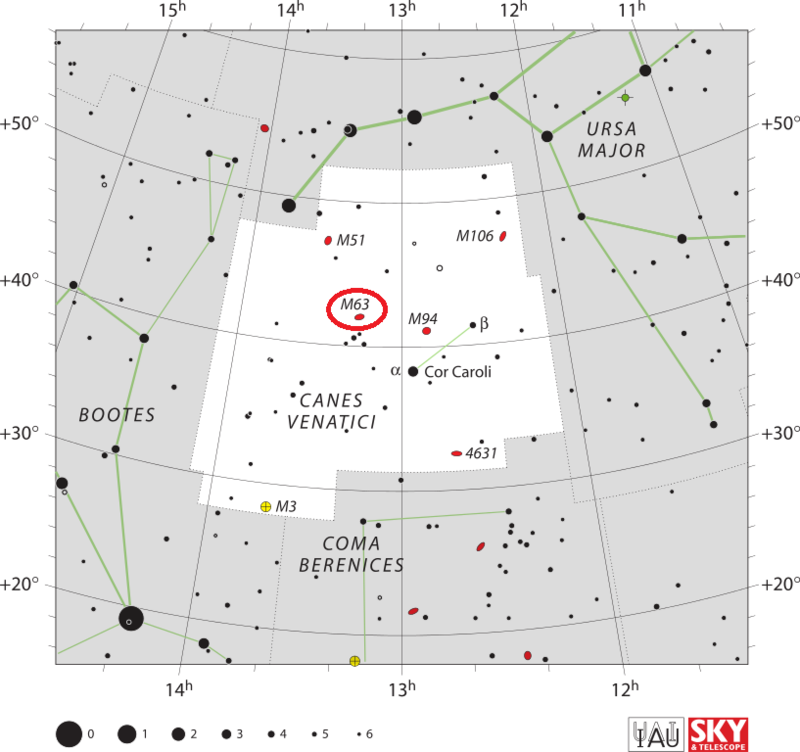 It is located about two thirds of the way from Alkaid, the bright star that marks the end of the Big Dipper‘s handle, to Cor Caroli, the brightest star in Canes Venatici. The Sunflower Galaxy can be seen in binoculars, but it only appears as a small, hazy patch of light or an out-of-focus star. Small telescopes reveal it to be a galaxy, but do not show the details of its structure. Medium and larger telescopes reveal the galaxy’s bright core and an oval patch of nebulosity around it. The spiral arms can only be seen in 8-inch and larger telescopes, while the dust lanes appear only in larger instruments. The best time of year to observe M63 from northern latitudes is during the spring. Messier 63 occupies an area of 12.6 by 7.2 arc minutes, which corresponds to a spatial diameter of 98,000 light years. This makes the galaxy roughly the same size as the Milky Way. M63 has a mass 140 billion times that of the Sun. The Sunflower Galaxy is one of the four Messier galaxies found in Canes Venatici constellation, along with Messier 51 (the Whirlpool Galaxy), Messier 94 (the Cat’s Eye Galaxy), and Messier 106. 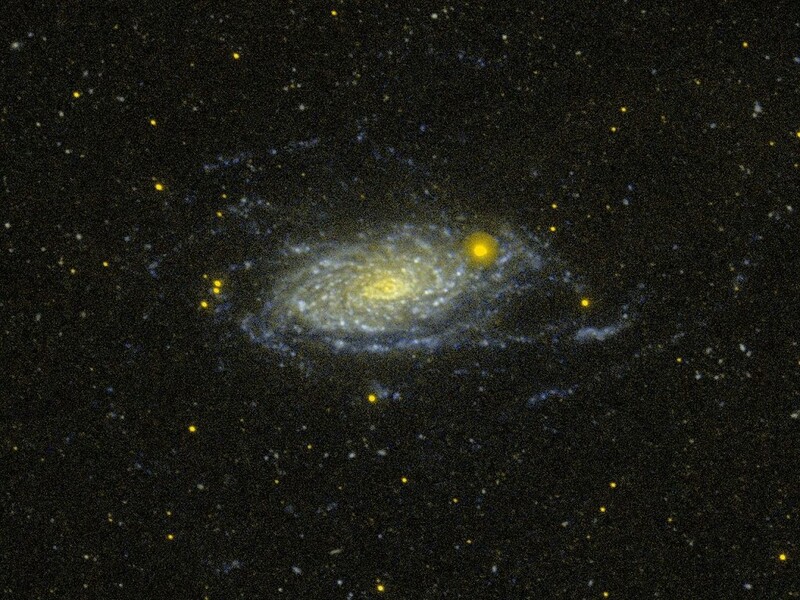 Messier 63 is known for its appearance, for which it was named Sunflower, with a bright yellow central disc and a number of short spiral arm segments dotted with starburst regions and dust lanes. 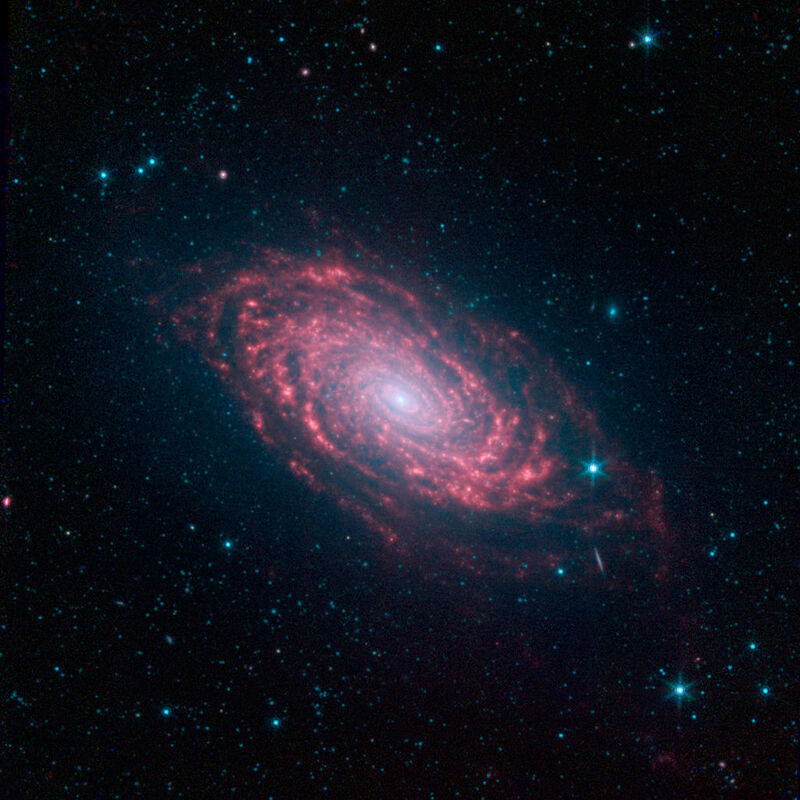 Infrared observations indicate that M63 has a two-armed spiral structure. The Sunflower Galaxy is a prototype for a class of galaxies known as flocculent spirals. It appears to have many spiral arms because the arms appear patchy and discontinuous. Flocculent spirals are the opposite of grand design spiral galaxies, which have a clearly defined spiral structure. Messier 63 is one of the members of the M51 Group, a group of gravitationally bound galaxies located in Canes Venatici, named after the brightest member of the group, Messier 51 (the Whirlpool Galaxy). The group also includes the edge-on spirals NGC 5023 and NGC 5229, and the irregular galaxy UGC 8331 (DDO 169). A Type I supernova was detected in M63 on May 25, 1971. Designated SN 1971I, it reached a magnitude of 11.8 and was discovered in one of the galaxy’s spiral arms. In 2011, astronomers discovered a tidal stellar stream in the galaxy’s halo. The faint giant arc-loop feature had been detected as early as 1979, but not connected to a minor merger with a dwarf satellite galaxy, disrupted as a result of interaction with M63. The stream of stars originated from the accretion of the smaller galaxy within the last 5 billion years. The fate of the dwarf galaxy is unknown, but the colour of the stars indicates that it was probably a galaxy belonging to the Local Group. Nebula discovered by M. Méchain in Canes Venatici. M. Messier searched for it; it is faint, it has nearly the same light as the nebula reported under no. 59 [Messier 59]: it contains no star, & the slightest illumination of the micrometer wires makes it disappear: it is close to a star of 8th magnitude, which precedes the nebula on the hour wire. M. Messier has reported its position on the Chart of the path of the Comet of 1779. The various spiral arm segments of the Sunflower galaxy, also known as Messier 63, show up vividly in this image taken in infrared light by NASA’s Spitzer Space Telescope. Infrared light is sensitive to the dust lanes in spiral galaxies, which appear dark in visible-light images. Spitzer’s view reveals complex structures that trace the galaxy’s spiral arm pattern. Messier 63 is 37 million light years away — not far from the well-known Whirlpool galaxy and the associated Messier 51 group of galaxies. The dust, glowing red in this image, can be traced all the way down into the galaxy’s nucleus, forming a ring around the densest region of stars at its center. The dusty patches are where news stars are being born. The short diagonal line seen on the lower right side of the galaxy’s disk is actually a much more distant galaxy, oriented with its edge facing toward us. An oval nebula on the chest of Asterion, the northern dog; discovered by M. Méchain in 1779. This object is of a milky-white tint, and brightens to the centre, where the nucleus resembles a small star. It is placed between two telescopic stars which cross the parallel vertically, while closer to it in the sp [south preceding, SW] is a third. Sir W. Herschel figured this object in the Philosophical Transactions for 1811, and describes it as very bright, extending from np [north preceding, NW] to sf [south following, SE], 9′ or 10′ long, and near 4′ broad, with a very brilliant nucleus. The mean apparent place was differentiated from Cor Caroli, from which it bears north-north-east 5deg 1/2, on the line indicated from Denebola through Charles’s Heart [Cor Caroli]. 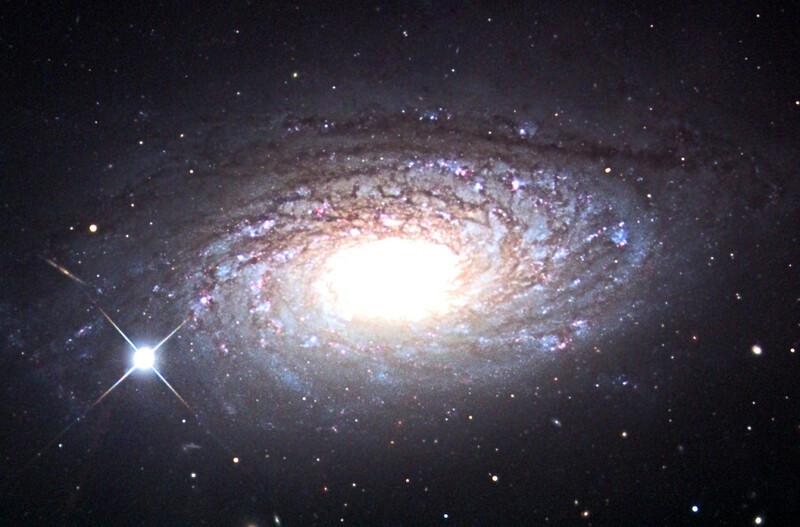 Messier 63 was one of the first spiral galaxies in which the spiral structure was identified. The first to do so was William Parsons, 3rd Earl of Rosse. Lord Rosse discovered spiral structures in M63 in the mid-19th century and included the object in his list of 14 “spiral nebulae,” discovered until 1850.